Preheat oven to 350 degrees. Spray a baking sheet with nonstick spray. Place 1 1/2 cups oats in a food processor. Add all remaining ingredients except chia seeds and raisins. Puree until uniform. 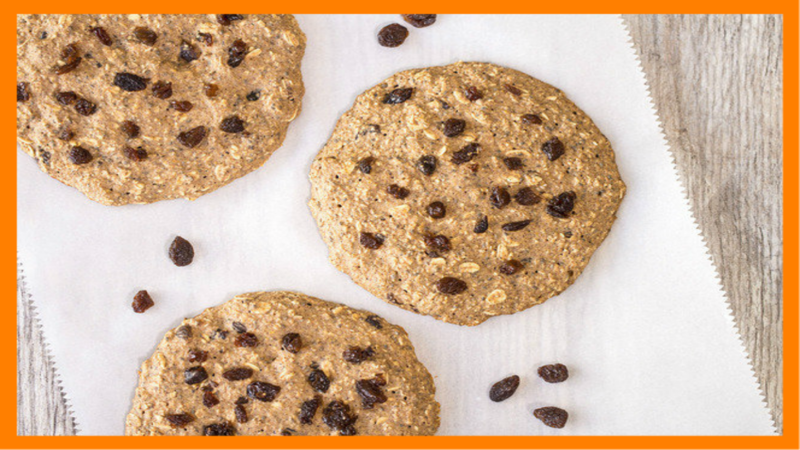 Gently fold in chia seeds, half of the chopped raisins, and remaining 1/2 cup oats. Evenly distribute batter into 6 mounds on the baking sheet, about 1/3 cup each. Use the back of a spoon to lightly flatten into 4-inch circles. Top with remaining chopped raisins, and lightly press into the batter. Bake until a toothpick inserted into the center of a cookie comes out clean, 10 - 12 minutes.